If the mountains and ocean are the scenic backdrop to Santa Barbara, the stage is set with remarkable architecture, and the romantic theme is a Spanish village in a Mediterranean ambiance. The architectural charm of Santa Barbara, characterized by white stucco walls and red tile roofs, is thanks to a group of people of incredible vision, who saw in the ruins of an earthquake in 1925 an opportunity to re-imagine what the city could be. 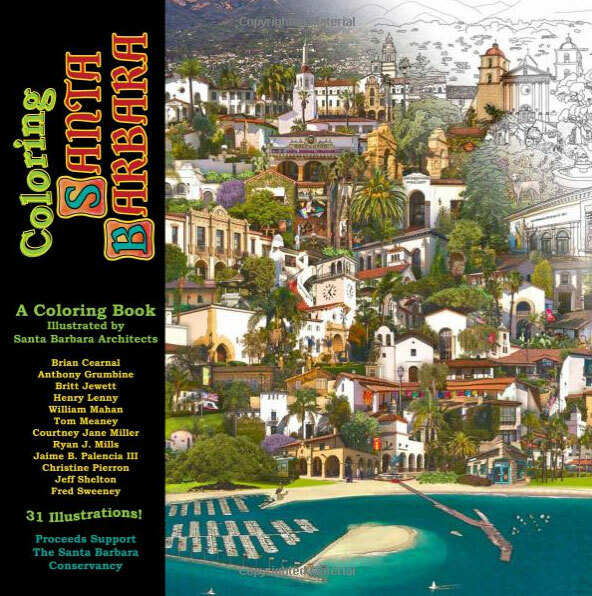 Coloring Santa Barbara aims to have a little fun! 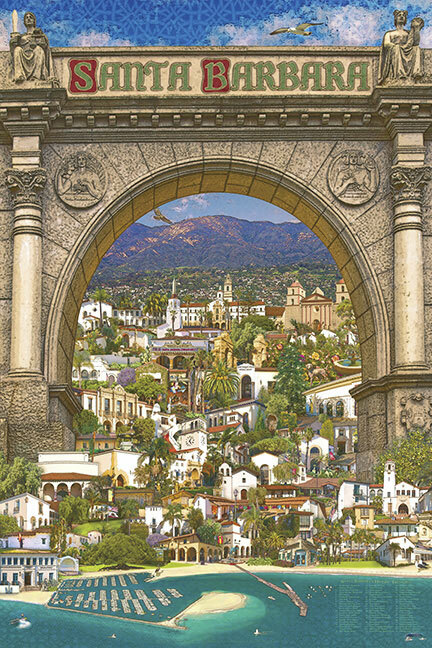 Twelve members of Santa Barbara s architectural design community generously gave of their time to create this sometimes romantic, sometimes whimsical, book of illustrations depicting this place we call home. All proceeds from this project support the efforts of The Santa Barbara Conservancy, which advocates for the recognition, preservation, and revitalization of historic, architectural, and cultural resources in Santa Barbara, works to increase public awareness of and participation in local preservation issues, and documents Santa Barbara’s wonderful historic resources through its publications. We are pleased to be working in conjunction with the Santa Barbara Trust for Historic Preservation and are selling our books and poster through their web store. Please follow the links below to make a purchase on the SBTFHP website. Though celebrated as “The American Riviera” by dint of its unique charm and unsurpassed beauty, Santa Barbara would not be the coastal urban gem it is today were it not for the catastrophic earthquake of 1925 and the determined efforts of a few visionary civic leaders in the years immediately thereafter. 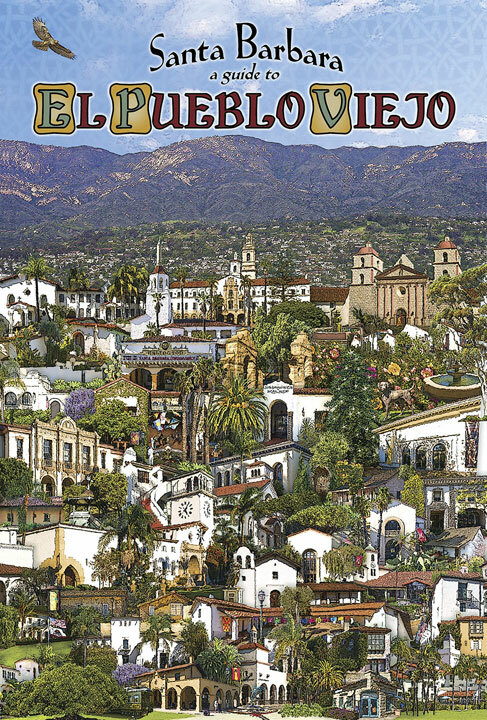 Such is the broad thrust of Santa Barbara – A Guide to El Pueblo Viejo, a new book published by the Santa Barbara Conservancy that explores the city’s extraordinary modern history by way of surveying its alluring Spanish-inspired architecture. Filled with maps, color photographs, and a wealth of historical detail and insights, the 294 page publication retails for $19.95 and is now available in local stores and online. 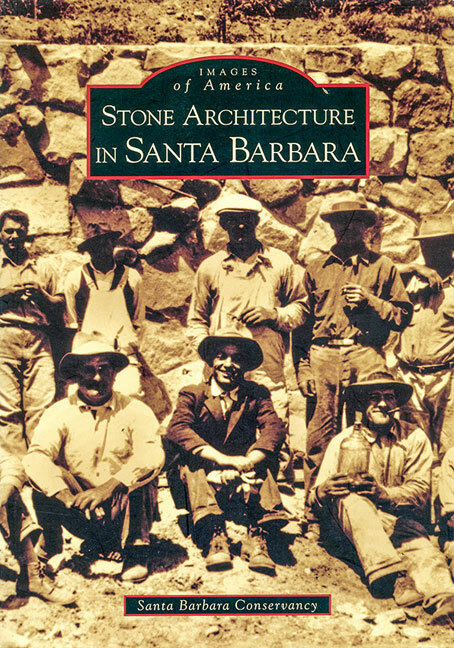 While documenting the miles of stone walls that line the many streets of Santa Barbara, members of the Santa Barbara Conservancy realized the immense value to the region and the world of all the area’s stonework. Through meticulous research, the Conservancy produced this volume using photographs both historic and modern that evoke the timelessness and beauty of stone construction. As Santa Barbara was evolving from a dusty little port and outlying resort into a vibrant and growing city in the 1870’s through the 1930’s, there occurred an extraordinary era of stone construction. This was made possible by a fortuitous conjunction of factors: abundant material, a cadre of expert artisans, and almost unlimited financing. This period provided an atmosphere not only conducive to the building of public spaces, homes, bridges, walls, and an assortment of other stonework, but encouraged some exceptional expressions of the stoneworkers’ art. Many of these artistic fabrications remain a testimony to the skills and tastes of their creators and add a distinctive element to the particular ambiance that makes Santa Barbara the special place that it is. fountains, and even animals. Photography and graphic design for the poster was by Steve Hausz, local architect, photographer, and graphic designer.